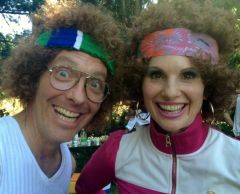 You’ll be smiling a little bit bigger, laughing a little harder, and your pelvic floor will be a lot tighter after this special guest appearance by Chip & Margie Sonofa-Gunderson. All the way from Shout Dakota, this former sister and brother, now husband-and-wife team of Certified Cheer Coaches will leave you slightly sweaty after a few of their positive affirmations. Craig and Jennifer Sutherland are the real-life marital team who are members of the notorious Vaudeville troupe, The Royal Famille Du Caniveaux. She’s a singer and a wigged wonder of one-liners and part of the duo The Washington State Fairies, and he’s an accomplished actor and pratfaller, sometimes at the same time! Their current collaboration includes mentoring and making sandwiches for their two understudies, Henry (age 7) and Chloe (age 5), as well as producing and hosting totally awesome events at their iconic property The JesusBarn Farm on Vashon Island.